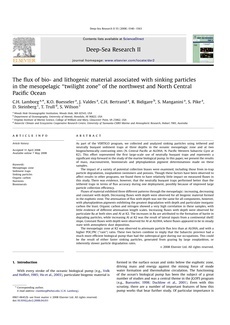 As part of the VERTIGO program, we collected and analyzed sinking particles using tethered and neutrally buoyant sediment traps at three depths in the oceanic mesopelagic zone and at two biogeochemically contrasting sites (N. Central Pacific at ALOHA; N. Pacific Western Subarctic Gyre at K2). This effort represented the first large-scale use of neutrally buoyant traps and represents a significant step forward in the study of the marine biological pump. In this paper, we present the results of mass, macronutrient, biominerals and phytoplankton pigment determinations made on these samples. The impact of a variety of potential collection biases were examined, including those from in-trap particle degradation, zooplankton swimmers and poisons. Though these factors have been observed to affect results in other programs, we found them to have relatively little impact on measured fluxes in this study. There was evidence, however, that the neutrally buoyant traps performed better than the tethered traps in terms of flux accuracy during one deployment, possibly because of improved large particle collection efficiency. Fluxes of material exhibited three different patterns through the mesopelagic: increasing, decreasing and constant with depth. Decreasing fluxes with depth were observed for all biogenic material formed in the euphotic zone. The attenuation of flux with depth was not the same for all components, however, with phytoplankton pigments exhibiting the greatest degradation with depth and particulate inorganic carbon the least. Organic carbon and nitrogen showed a very high correlation in these samples, with little evidence of different attenuation length scales. Increasing fluxes with depth were observed for particulate Ba at both sites and Al at K2. The increases in Ba are attributed to the formation of barite in degrading particles, while increasing Al at K2 was the result of lateral inputs from a continental shelf/ slope. Constant fluxes with depth were observed for Al at ALOHA, where fluxes appeared to be in steady state with atmospheric dust deposition. The mesopelagic zone at K2 was observed to attenuate particle flux less than at ALOHA, and with a higher POC/PIC (‘‘rain’’) ratio. These two factors combine to imply that the Subarctic province had a much more efficient biological pump than had the subtropical gyre during our occupations. This could be the result of either faster sinking particles, generated from grazing by large zooplankton, or inherently slower particle degradation rates.